A return visit to eccentric turning will cover the latest workholding creation from the master of eccentric turning, Jean-Francois Escoulen. 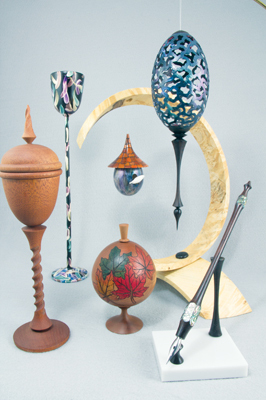 While eccentric turning isn't for everyone, it is an interesting area to explore as you progress on your woodturning journey. For those interested in offcentre turning alone, we'll look at the new offering by Penn State Industries. 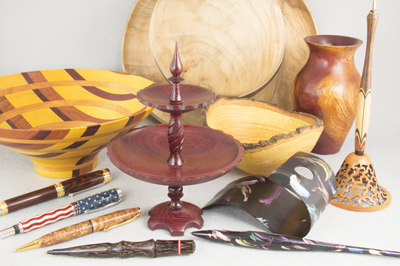 The cost of equipment does play a significant part in the decision making process for most of us in the woodturning community. In the closing segment, I'll look at a few items at both ends of the cost spectrum and some homebuilt items that to make yourself will consume a bit of your time, but will incur very little out of pocket expense. Also included are new items, several items that space prohibited in the past, and ideas for the adventuresome. 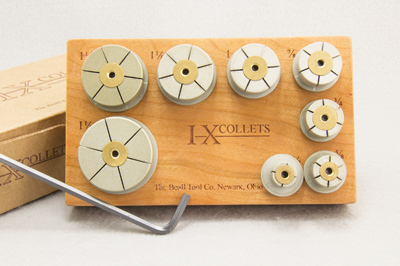 The name Escoulen is synonymous with eccentric turning. There have been several chucks designed by Jean-Francois specifically for that purpose. His latest design carries on the tradition taking that speciality turning even further. 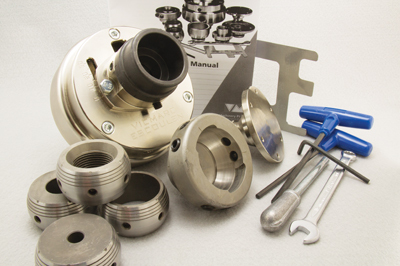 The Vicmarc-Escoulen eccentric chuck offers the turner so many options that it will keep you exploring for years. Massively built, the design and construction allows for both eccentric and multi-centre turning as well as the marriage of both. There are a host of available options including a faceplate, different sized taper rings and a threaded adaptor allowing for a vast array of attitudes for a faceplate as well. It also has a clever system of counterweights that can be positioned to help balance things to reduce vibration. Priced on the upper end of the scale, the chuck and accessories are absolutely top shelf design and manufacture. 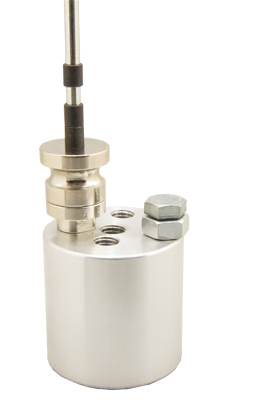 A very impressive workholding device with virtually limitless options. 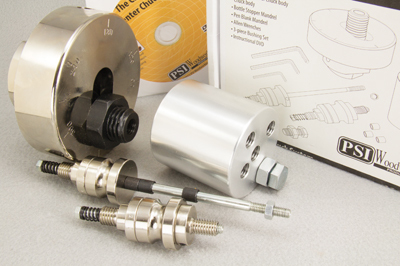 A recent addition to the offcentre turning chuck market was made by Penn State Industries. 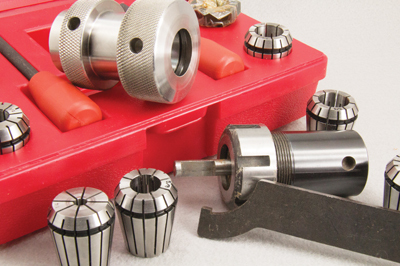 Back in part seven - issue 244 - of the series, we looked at the Vermec multi-centre chuck. Both offcentre - or multi-centre if you prefer - function similarly but use different mechanics to achieve it. They are both very workable systems targeted at different price points. Taking a few moments to understand the mechanics of each will allow you to take advantage of the concept in your other workholding needs. The beauty of the Penn State system is just that, it is a system. 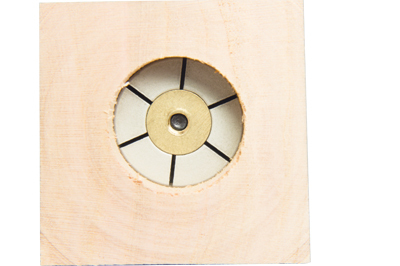 The multi-centre chuck can be used alone but it comes with pen and bottle stopper mountings. 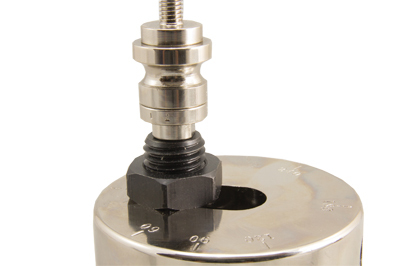 Those mountings along with the ability to fasten a chuck or other headstock threaded device to the multi-position centre makes this multi-centre chuck a very flexible workholding device. Attractively priced and very flexible with the included accessories, it is a tool that might get you engrossed in the offcentre or multi-centre turning experience. 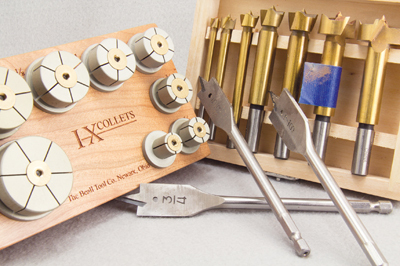 A recent offering from the Beall Tool Company is a set of expansion collets. These collets are available as a set or individually. The set comes housed in a beautiful cherry storage plaque. The set ranges from 1/2in to 1 1/2in in 3mm steps. Of course, these work in the same manner as an internal fitting jam chuck with the advantage of convenience. You can expand the collet to have the amount of force you want, reach deeper into the turning than the typical jam chuck, and have the immediacy of use for standard sizes. While you can turn the inner diameter to accept the collet, couple this collet set with a set of Forstner or spade bits and you can really speed things up if that suits your needs. 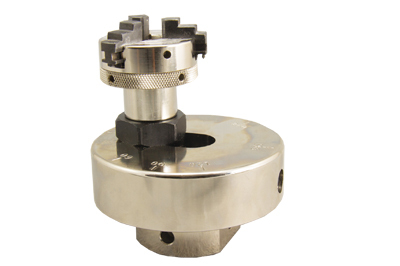 With a 1/2in mounting shaft diameter, these collets can be clamped in a drill chuck, 1/2in collet, or regular chuck with spigot jaws. There are a number of offerings of contraction collets. Directly from the machine tool industry, these offer the turner the same workholding flexibility as expanding collets. 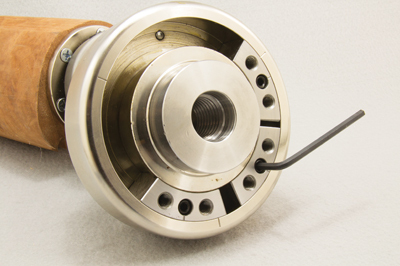 Singly or in sets of standard sizes, they constrict from a certain dimension to smaller - within its travel limit - via a drawbar or compression clamp mechanism. 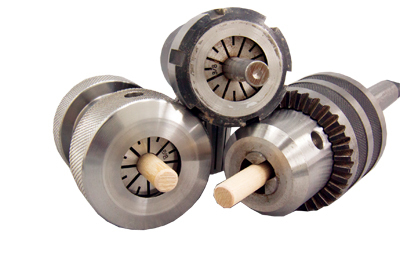 Drawbar types use the lathe taper to constrict the collet with the drawbar tensioning it and holding it in place. The other types thread on to the headstock and incorporate their own taper to compress against via a cover plate. These are of the machine tool industry standards so replacements or additional collet sizes are available providing you buy the correct family. The reasons to select a collet over a drill chuck equipped with a taper mount is the amount of engagement and the safe use without a tailcentre. The drill chuck will engage the material with the three jaws but being adjustable over a large range, the jaw size is limited. The collet having a much smaller range will have much more contact with the material increasing the strength of the grip considerably. This is also true of the expanding collets. The amount of surface contact with the inside of the hole in comparison to chuck jaws is much greater. The other advantage is that the collet is fastened to the lathe so when the tailcentre needs to be removed, the mechanism is still securely attached to the lathe. 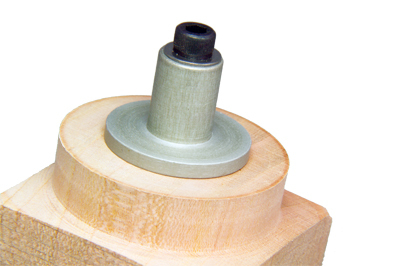 With a drill chuck on a Morse taper, once the tailcentre is removed from the process, the taper is the only mechanism holding the drill chuck - and the piece of work - in place. 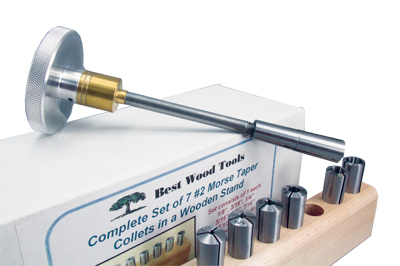 Speeds and feeds need to be tempered considerably with only the taper being the attachment method to prevent it from becoming loose and rattling out of the lathe taper. For the shop handy turner, there is a big world of opportunity when you begin making your own chuck jaws. 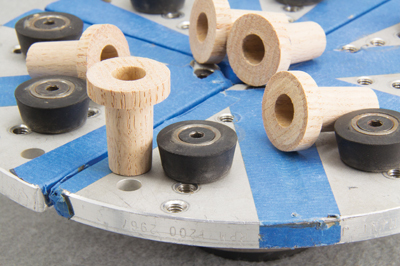 These can be as simple as special function replacement buttons to thread into your Cole jaws. The rubber buttons included do a nice job but the ability to replace them with wood or metal customised to your needs gives you a new freedom in your workmounting. 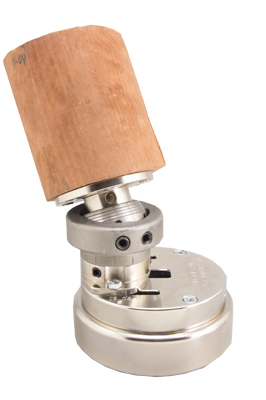 The beauty of wooden jaws on the Cole jaws or a regular chuck is both low cost and a perfect fit. 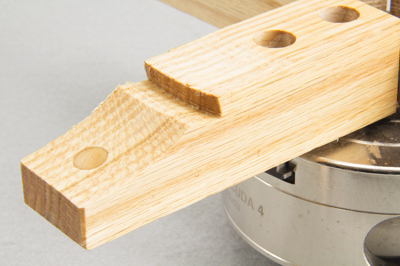 Much like a jam chuck that is cut until you achieve exactly the fit you desire, wooden jaws can be mounted and turned in place until they achieve your exact needs. They also have the advantage of being able to be cut into without fear of hitting metal jaws or doing permanent damage. When your wooden jaws become unserviceable, it is time to make a new set. Low cost, tuned to fit, can cut right to or into, and throw away when spent. If you are going to tackle eccentric turning, this and past solutions shown will work nicely. It is an area of turning where you can not only create some very exotic designs but challenge yourself mentally. 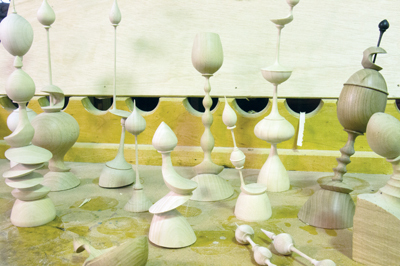 To be able to visualise the result desired and mechanise the turning process appropriately is a real talent. The same can be said for multi-centre turning. As we close this series, reflect back on the fundamentals that have been emphasised. Always be certain that your highest priority is on the safety aspects of the workmounting and then the turning process. The accuracy and repeatability issues have been dealt with in many of the parts of the series. They will hold true and serve you well if you consider them in all of your workholding endeavours whether commercial or home built. Never be daunted by the more difficult or unique materials you might face. There is a way to safely mount and turn if you think through the process and don't be closed minded. Commercial solutions, adaptations of available products and homebuilt are all in play. Never forget the safety aspects! If you have doubts, don't do it. You don't need to take risks. Re-group, re-think, and do it again until you get to a safe solution. On the safety aspect, I'd like to adapt the age old admonition of 'mind your pints and quarts' to 'mind your speeds and feeds'. It has everything to do with safe operation. A mounting that is safe at one speed might not be as safe at another speed or if you are asking too much of that mounting based on your cutting demands. Creativity in your workholding is as important as creativity in your turning. They both will add value to your end result. Always be safe but also be creative.